We've been working some magic with Ombre Confetti fabrics! Wave your own magic quilting wand at our next retreat! 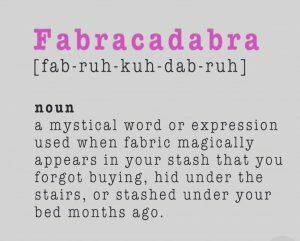 ...I shuffled a few things in my sewing room to work on one of my summer sewing goals and like magic, I discovered a project that I just HAVE to do! At the rate my summer to-do list is growing, it's going to take a retreat to ensure I can wrap things up. Let's do it! I know I'm not the only quilter ready to wave that magic sewing wand and finish up some projects. Join me at our up-coming UFO retreat where we can spend two days working on those FABRACADABRA wonders! Friday, September 7th, 10 a.m. - 11 p.m. and Saturday, September 8th, 10 a.m. - 7 p.m.
at the Gathering Place on Hobble Creek just one block east of the quilt shop. $89 includes lunch both days, swag, games, prizes and fun with quilting friends! Register here on our website, by phone or at the shop. We're gonna make those UFO's disappear! The Ombre Confetti Metallics Collection by V and Co. are pure fabric magic! We have had so much fun at the shop playing with this rich rainbow of color sprinkled with metallic gold confetti. The ombre effect spans the width of the fabric so that each strip you cut ranges in value from deep saturated color to soft pastel hues. The confetti adds just enough sparkle to add interest and make your projects shine! In fact that's the name of this quilt, SHINE by, Melissa Corry. 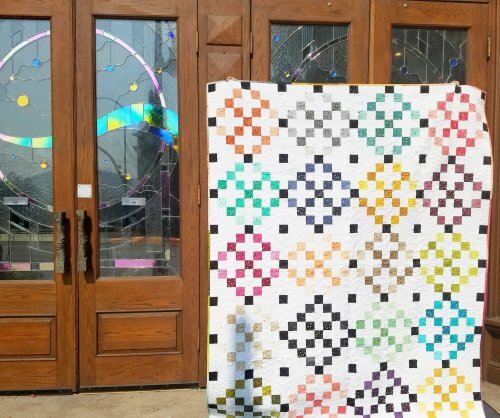 Julie Hancock spotted the free pattern download at modabakeshop.com , fell in love and - - voila - - pieced this captivating quilt! We have kits! Chris Chamberlain has been working some magic with the Ombre Confetti Metallics as well! Isn't it fun to see how one fabric collection can look so different when paired with a different background? 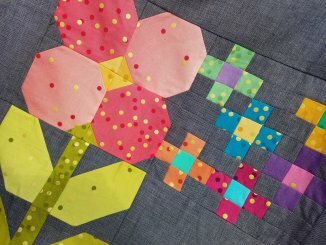 We can't wait to show you more of the Walk in the Park quilt by V & Co.! It's currently being quilted by Ramona. Kits are on the way as well! ...and one more magical use of the Ombre Confetti Metallics... Hello Pouches by Knot & Thread Design can be made in four different sizes. They boast a quilted base for stability and a see-through vinyl top so you can say "hello" to all your treasured trinkets! 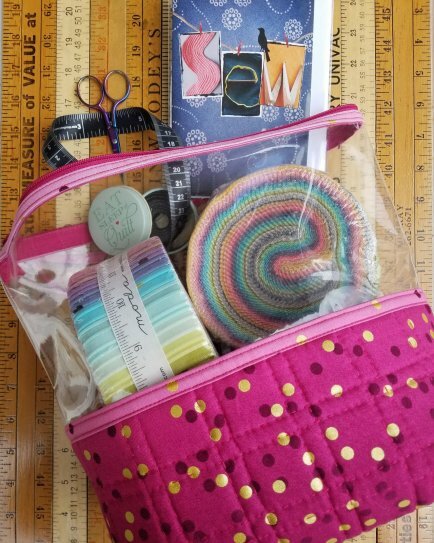 Shelley Taylor will be teaching you how to make these adorably handy little bags at our retreat center on Saturday August 18th, 10 a.m. - 1 p.m. $20 class fee. Pattern and supplies purchased seperately. Register here on our website, by phone or at the shop. We have just a few of the Ombre Confetti Metallics jelly rolls you see stashed in this Hello pouch. Get them before they vanish! August 4th 9:00 a.m. - 5:00 p.m. The time has finally come for Corn Wagon's first Saturday Sampler to begin! Doors open early at 9 a.m. Demos will take place every 30 minutes beginning at 9:15 a.m. Last demo begins at 12:45 p.m. Amy McClellan of Under the Garden Moon will be teaching this first month to help us kick things off. We can't wait to see what our first month's assignment will be! August 6th - 25% off BOOKS & PATTERNS! August 28th at 1:00 p.m. here at the shop!